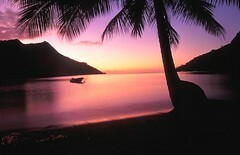 I took this on Moorea in French Polynesia after makng it back to the shoreline. I had been hiking all day and got kind of lost on some trails in the forest of the island, I ended up finding my way out on some forest or logging road as it was getting dark. Walking back to the accomodations I was exhasted and some Tahitian dude offered to drive me back. In the car he offered to sell me some pot. Apparently, the reason Americans go there is for the pot. In any case it was nice of him to give me a ride. A long but memorable day.